Your bonus for keeping in touch with us! Social Actions Toolkit. 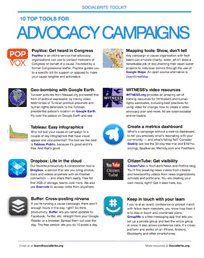 A full-color e-guide of top advocacy tools, campaign tactics, social action hubs, collaboration tools, mobile apps and hashtags for social change (6 pages). Sign up now and get the toolkit for free! Of course, we’ll keep your information private, and we’ll never spam you.